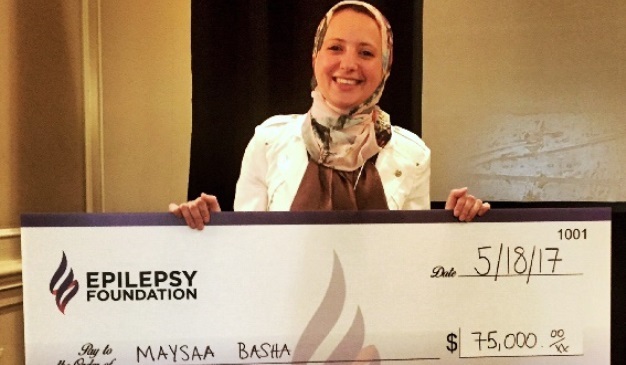 A non-invasive seizure detection system in which sounds can be used to alert caregivers and loved ones that a patient is having a seizure won $75,000 in the Epilepsy Therapy Project's sixth annual Shark Tank Competition held at the 2017 Antiepileptic Drug and Device Trials Conference last week in Aventura, Fla.
Maysaa Basha, M.D., an associate professor of Neurology at the Wayne State University School of Medicine and a neurologist at the WSU Adult Epilepsy Comprehensive Center, presented the project on May 18. Dr. Basha, who received her medical degree from the WSU School of Medicine in 2005, was one of three winners the judges awarded with funding. "We're very excited and ready to get moving on the project," Dr. Basha said. "The next steps include software development and clinical testing. We would like to have that done over the next year." The competition is named after the "Shark Tank" program on ABC television that allows entrepreneurs and inventors to pitch their ideas to industry investors. "Our project can have immediate and direct impact on the quality of life for patients with epilepsy and their caregivers," she said. "Overall, the judges thought it was a feasible idea with potential to have a positive impact on quality of life." She is the principal investigator on the project, "The Sound of Seizures: Audio-triggered seizure detection," which proposes a method of identifying and capturing seizure-specific sounds such as ictal cries or grunting in a monitoring unit. The goal is to reduce the risk for respiratory distress, physical injury or sudden death in epilepsy patients who experience frequent generalized tonic-clonic seizures. Ming Dong, Ph.D., associate professor of Computer Science in the WSU College of Engineering, is the co-principal investigator on the project. "It is exciting to see that advanced acoustic signal processing and analysis technologies could be used to help with seizure detection and related patient care," Dong said. "This is yet another step forward in smart and connected health research conducted in my lab, in which data-driven computing techniques are applied to address problems in the medical and health domains." The winning entry was selected through live voting by conference attendees and a panel of judges representing physicians and scientists, corporate executives, leading industry investors, people with epilepsy and advocates. A proprietary signal-processing software can be used to create an electronic signature for each sound type, which can be embedded into a smartphone app that triggers a notification when a seizure occurs to alert caregivers. Dong said that the funding will be used to collect acoustic data and develop algorithms and software for sound analysis. "The alarm system can alert caregivers to provide early care to the patients, limit injuries, and limit confusion and wandering that can occur after a seizure," she said. "I feel like it can help with independence to the patient and peace of mind to the caregiver or relative. I see many college students with epilepsy or adults who are ready to live on their own. These patients are often accompanied by moms who still get up every night to go to their adult child's room and make sure they are OK, so it becomes a difficult situation. The same is true at the other end of the spectrum, with an elderly patient who still wants to live on his or her own, but their relatives are concerned about undetected or unknown seizures."